Bandile Mdlalose addresses SACSIS/Friedrich Ebert Stiftung roundtable discussion on "The Media and Climate Change." Click for full video on the Abahlali baseMjondolo website. And I find myself once again agreeing, yes the language has become too much, hasn’t it. And yes, it does leave the poor out of the conversation and yes it does ignore the daily struggles of the poor. At the rate we are going, we will be talking our planet to death. A lot of these problems were the downfall of COP 15 and are likely to provide insurmountable in COP 17 as well. And really what can we expect, the language has become too much: too much talking, too much ignoring the poor (most of the world, lest we forget). And speaking of class as it relates to climate change, Foster + Partners just released their master plan for integrating the British transit systems. It is very cool. And huge. Colossal. It makes the word colossal seem quaint. It’s the sort of planning project that comes around only as often as ambition that boundless. So what does it have to do with class, or climate change? Foster’s Thames Hub, is slated to be the integration of all genres of travel, freight, logistics, and even energy and information. Foster + Partners offers as its impetus for the scope of the project “Britain can no longer trade on an inadequate and aged infrastructure… We are rolling over and saying we are no longer competitive – and this is a competitive world.” The explanation of the project is sopping with bravado and enthusiasm for global capitalism, touting its ability to “maximize trade links” and offering an endorsement from a noted consultant on the positive effects of agglomeration on capitalist markets. Lord Foster (hilarious that he’s a “Lord”) even goes so far as to assert that “I believe we do not have a choice” as to building this colossus of infrastructure. The Thames Hub, Foster + Partners. Click for F+P's project description. Image Copyright Foster + Partners. Of course this is as silly as the presupposition that global capitalism and Britain’s success therein is what is singularly good, righteous, and necessary to the prosperity of future generations of Britons. On the one hand the architecture geek in me who has appreciated master planning gestures of similar grandeur is inspired by the problem solving, even simply the ambition involved and embodied in the Thames Hub. The sustainable urbanist in me wonders when enough will be enough. 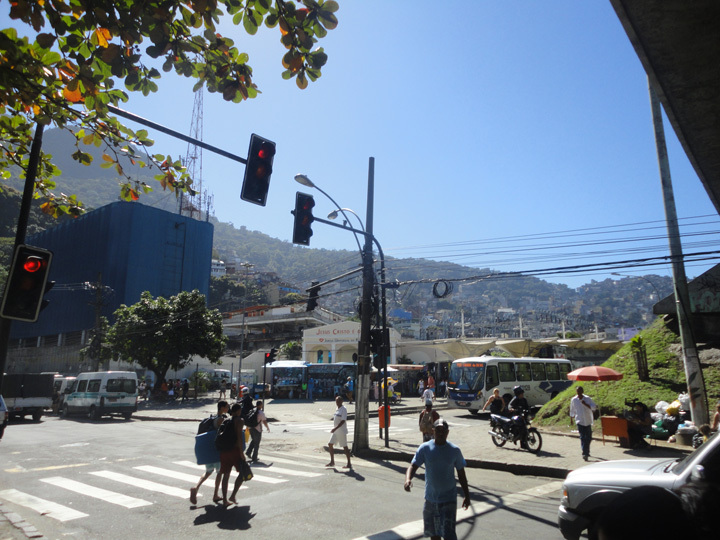 I set out in the post to write about mass transit in Rocinha, Rio de Janeiro. It is what you might imagine that it is. The Gavea Highway, is the historic circulation artery of the northwestern flank of the Two Brothers Mountain that separates Gâvea from São Conrado, the valley that eventually morphed into Rocinha, the largest most developed of favelas cariocas. 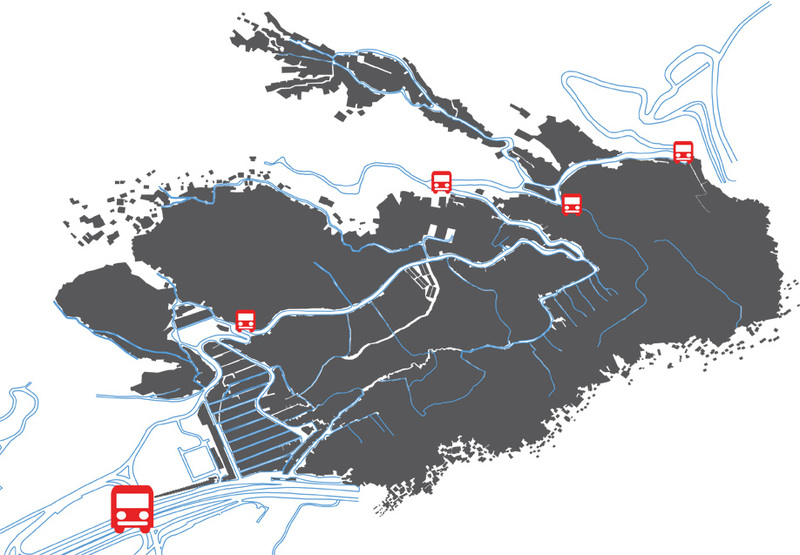 Rocinha grew around that artery because it relies on the simplicity and availability of the public transit that uses it. Rocinha's stretch of Estrada da Gávea just below Laboriaux. Note the business of transit options. At the foot of the valley the Largo das Flores houses an impromptu transit hub that features shuttles, taxis, mototaxis, and busses so frequent that one scarcely ever has to wait. It operates, despite it’s loosely planned character, with an efficiency that should make any free-marketeer proud. But perhaps most importantly, it’s scale is reasonable, local, compact, even personable. Of course, it often seems like the free-for-all that it really is, chaotic even raucous, But in a world of too-big-to-fail institutions we would be wise to take a cue or two from the locally-oriented, people-scale of Rocinha’s transit operation. Bus icon along Estrada da Gávea indicate some of the more frequented stops. Busses, shuttles, taxis and mototaxis frequent this route. The large icon indicates the largest transit hub. Largo das Flores, also called Largo da Igreja below Rocinha. 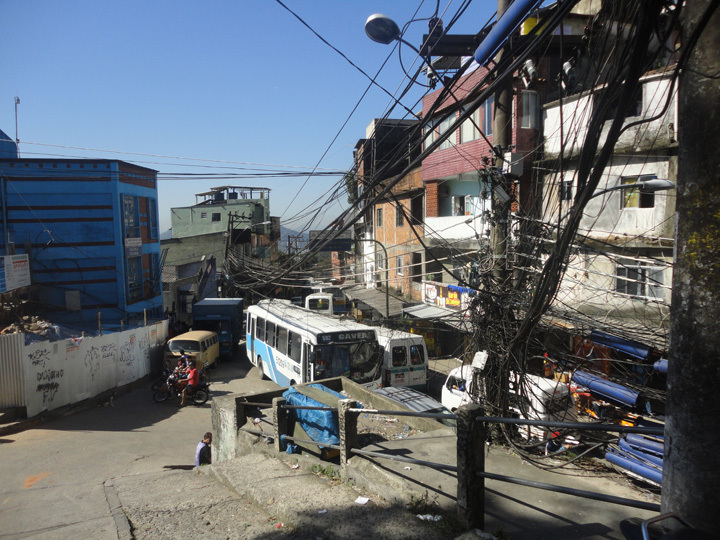 In less than half an hour one can reach this transit hub by foot from anywhere in Rocinha. The world’s poor are of course being left out. They have borne the brunt of the ever-expanding competition of global capitalists. Favelas and informal developments the world over are a living testament to that. And the world’s poor are disproportionately bearing the brunt of global climate change’s negative side effects. It’s the double whammy no one deserves, least of all those who are least involved. Not only should those meeting in Durban be listening to the poor, but emulating them as well. The capitalists have come up with the problems and as economic and environmental crises widen and deepen, the moderation and resilience of places like Rocinha will outperform and outlast the Thames Hub and other monuments to global capitalism. ← The Olympic Juggernaut Hits Rio de Janeiro: Is there a compelling new story?